United Kingdom Royal Fleet Auxiliary (RFA) Fort Victoria (A387) held a commemoration event marking the 100th anniversary of the sinking of RMS Titanic whilst on patrol in the Gulf of Aden, April 15. Third Officer Niall Gordon, RFA, leads a memorial ceremony for the 100th anniversary of the sinking of RMS Titanic attended by the officers and sailors of Royal Fleet Auxiliary Fort Victoria and the battle staff of Combined Task Force (CTF) 151. At sunset a moment of silence was held to remember the 1,517 lives lost, which took place 100 years ago to the day. 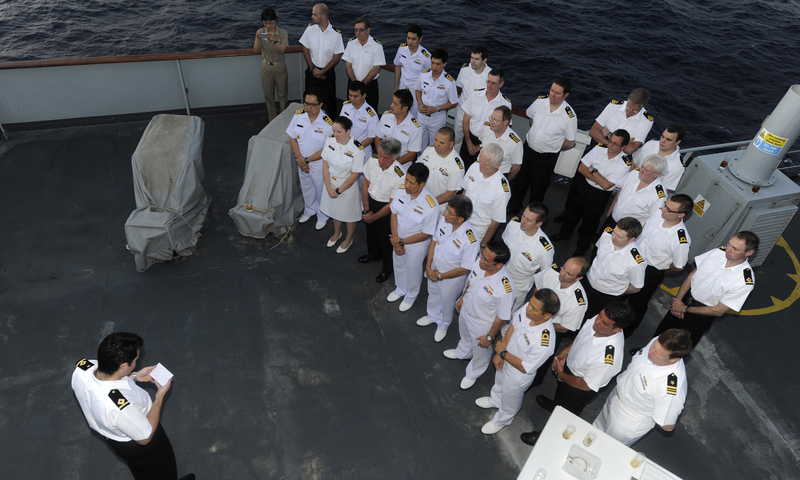 The event was attended by the Commander of Combined Task Force (CTF) 151, Rear Admiral Tanin Likitawong, Royal Thai Navy, with the officers of Fort Victoria and the multinational Staff of CTF 151. Many of the improvements in maritime safety which came out after the disaster, most notably the International Convention for Safety of Life At Sea (SOLAS), still govern and regulate safety on board merchant vessels around the world today. 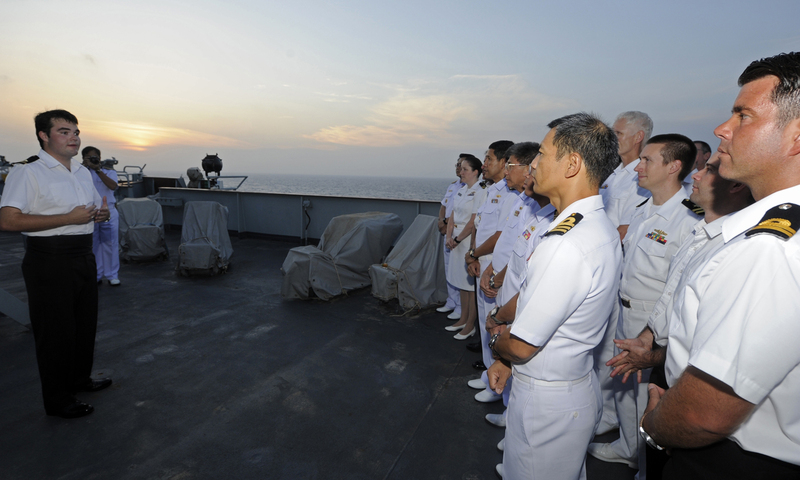 FORT VICTORIA recently assumed the role of flagship for CTF 151 led by Rear Admiral Tanin Likitawong, Royal Thai Navy, with Thai command staff and representatives from the U.S., South Korean, Danish, Dutch and Italian navies. CTF 151 is a multi-national mission-based Task Force, working under the Combined Maritime Forces to conduct counter-piracy operations in the Red Sea, Gulf of Oman, Somali Basin and Arabian Sea. Officers and Sailors of Royal Fleet Auxiliary Fort Victoria and the battle staff of Combined Task Force 151 attend a memorial ceremony for the 100th anniversary of the sinking of RMS Titanic.